Emmanuel Boateng - IDE Inc.
Emmanuel Boateng is a very talented member of IDE’s industrial design team. A designer with a BFA in Industrial Design from the Massachusetts College of Art and Design, America’s oldest private art institution, Emmanuel is also a very talented visual artist who paints, sculpts and creates animations. Emmanuel brings a renaissance approach to his designs solving problems with functional, aesthetic, user-sensitive solutions. 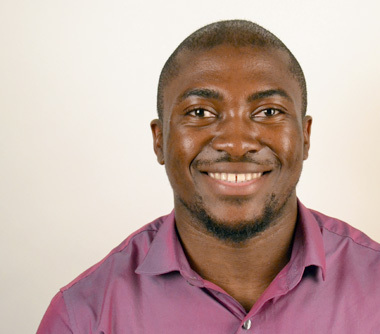 Since joining IDE in 2015, Emmanuel has made significant design contributions to projects ranging from state of the art Bio-tech cytometry systems, portable fuel cell power packs, instruments used in digital pathology, to cutting edge sensor systems used for new products targeted for the “internet of things”. Prior to joining IDE, Emmanuel was a consulting industrial designer at Ideology Product Development, a Massachusetts based product design consultancy, where he gained experience in designing diverse products such as toys and kitchen appliances for companies such as Dorel, Kids Galaxy and Princess House. Emmanuel is very health conscious person and has designed several medical devices on his own. One of these devices is an innovative new inhaler for asthmatic children that is much easier and less embarrassing to use. The other is a radically improved ear thermometer that addresses usability issues discovered by observing his younger brother trying to use current products on the market. He is also in the process of prototyping a new concept for a water vessel designed for use in his native country Ghana that will prevent injuries that can occur from carrying heavy, non-ergonomic containers of water.